May 20, 1775. That date doesn't mean much to most people. But to residents of Charlotte, it's a pretty big deal. 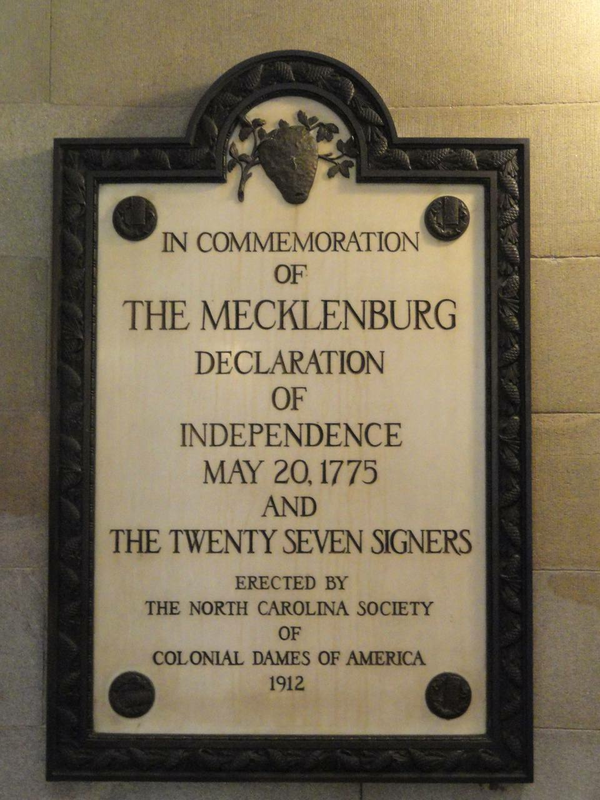 That's the date that the Mecklenburg Declaration of Independence (also called the "Meck Dec") was signed. There is controversy surrounding the document. Some historians deny that it even existed. But if the prevailing story is true, this would be the very first declaration of independence in the United States - predating the country's declaration by about a year. The story goes that when residents of Mecklenburg County heard about the battles of Lexington and Concord in Massachusetts that started the American Revolution, they decided they'd had enough. Despite the fact that this town was named in an attempt to stay in the good graces of the British King George III, a document was written that essentially declared that the British has no authority over this county. This document was given to Captain James Jack, who rode to Philadelphia on horseback and presented it to Congress. The North Carolina delegation there told Jack that they supported what he was doing, but it was too premature for Congressional involvement. Historians will also argue that the Mecklenburg Declaration of Independence wasn't a true declaration of independence at all, and actually didn't even exist. They suggest that it was simply a reimagined version of the "Mecklenburg Resolves" - a document published in 1775 that claimed intent to, but never actually went so far as to declare independence. The Mecklenburg Declaration was supposedly published in a newspaper in 1775, but any evidence of this and the original text was lost in a fire in the early 1800s. The text of the "Meck Dec" was recreated and published in a newspaper around the mid 1800s. Historians claim that the newly discovered text though, borrowed wording from the United State Declaration of Independence - now about 50 years old. This led to claims that the "Meck Dec" never really expressed an absolute freedom, and that people were just remembering and retelling (incorrectly) the Mecklenburg Resolves. The debate essentially boiled down to this question: did Thomas Jefferson borrow wording for the U.S. Declaration of Independence from the Mecklenburg Declaration or was it the other way around? While historians debate existence of the document, Charlotteans know fully well that it existed. You'll find this date on the state flag and state seal of North Carolina. For a long time, May 20 was an official state holiday in North Carolina, and celebrated even bigger than the Fourth of July. The city would hold a parade and reenactments on that date, schools were closed for the day (sometimes even the whole week), and Presidents would often visit to speak. Over the years, four sitting U.S. Presidents spoke here on "Meck Dec" day - including Taft, Wilson, Eisenhower and Ford. Around 1820, John Adams heard about the supposed years earlier publication of the "Meck Dec" and began to refute its existence. Since the only evidence was lost, and most eyewitnesses were dead, there was nobody to vouch for the opposing story. Adams' comments were published in a Massachusetts newspaper, and a North Carolina senator set out to collect supporting evidence, including eyewitness testimony. Several witnesses agreed that Mecklenburg County had indeed declared their independence on the supposed date (but these witnesses would disagree on smaller details). It turns out that likely the most knowledgeable witness - Captain James Jack - was still alive at this time. Jack confirmed that he had definitely delivered a document to the Continental Congress during that time, and that document was most assuredly a declaration of the independence of Mecklenburg County.